Beauty is an internal thing. Beauty is not in the eyes of the beholder, not in people, and not in objects. It sprawls in every person heart. Beauty is reflected naturally in the hearts such as a glow and radiance on a person’s face. Beauty is go long away and is not restricted to your skin. But a person skin is one of the most salient expressions of the beauty. We are made from spirt and matter. This signifies that our skin, behind the noticeable outer layer is full of activity and life. Like other part of our body, skin is also an organ and required to be kept as nourished and healthy. Many of the beauty treatments which are currently available fulfills our physical requirements but do not disclose the hidden secret behind radiant, energetic and glowing skin. There are various workarounds for glowing skin and natural beauty which also helps in rejuvenating and cleansing the skin. 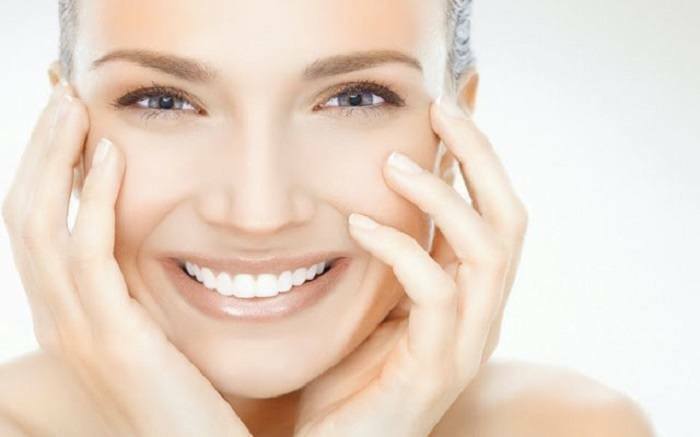 Here we providing 8 important tips for glowing and healthy skin. Water is an alkaline with pH 7.4. It is the free and one of the highly efficient treatment for various types of skin related problems. It stops dehydration and able to produce oil or serum from sebaceous glands. Your skin requires water for proper functioning. Nutritionists and doctors advises to drink 7 to 10 glasses of water every day. It is the energy of life. You need to drink at least three liters of water every day. Water keeps your whole body energized, hydrated, plumps up your skin and flushes out the toxins. Nutrition plays a very important role for the health of your skin. Certain foods like dairy products and acidic foods are known to be highly effective in inducing the allergic reaction in some persons. Chocolates is one of the highly debatable topic in the subject nutrition. Some people has views that chocolate is responsible for your skin condition, some people says not. Whatever the outcome might be, the best solution for you is to eat nutritious and balanced diet including fiber, green leafy vegetables, and fresh fruits. Make it a habit to listen to the requirements of your body and with regular practice, you will start to find what your body is desiring. Go for a blood test, take those supplements which are required for your body. By seeing the advertisements there is not need to buy capsules, powders and health tonics. Take some super green powder such as chlorophyll, spirulina, a non-synthetic multi vitamin, and 1000 mg of vitamin C regularly. Some person commits biggest mistakes such as eating a no-fat or low-fat diet. Your body requires fatty acids for good health. Evening primrose oils, virgin olive oil, coconut oil, sunflower seeds, chia seeds, hemp seed oil, flax seed oil, and Avocados are best for your skin and stop wrinkles. The human body requires food for survival, is made of living skills and is a living organism. When your body receives the proper nutrients then it heals itself. It is very important to nourish and feed your body. Therefore, it has the source and energy for repairing and healing. Feed your body with nuts, meats, fish, vegetables, fresh fruit and nutritious wholefoods. Eat a diet consist of vibrant and bright foods like beetroot, carrots, strawberries, blueberries, mangoes, and tomatoes. Eat green leafy vegetables such as broccoli, spinach, kale and rocket to keep your body alkalized which helps in inflammation of your skin. Make your skin glow by eating healthy oils such as coconut oil, olive oil, nuts and avocado. A low and clean GI carbs diet will enhance the quality of your skin and decrease acne. Some options are millet, quinoa, oats, rye breads and brown rice. Also eat fresh seafood such as sardines, and oily fish such as salmon. These are very good sources of omega 3. Take sufficient amount of vitamin D also. It is found in liver, eggs, yoghurt, cheese, tuna and fresh salmon. Our body is made from the food, which we eat. The juicy, clean and fresh foods have good impact on our skin. Skin experts have the view that exfoliating your skin is one of the best method to get a beautiful skin. Therefore, buy a good quality body loofah or exfoliant. Lifecell ingredients is able to remove the dead skin cells from your body. Exfoliate your skin two times in a week and prevent growth of ingrown hairs. However, it is necessary to not use any body exfoliant on your face and the skin. Get into a healthy beauty routine for facial skin care. Many doctors advise that you tone, moisturize and cleanse your skin two times in a day. During cleaning also cleans the area around the neck, including the face. After that apply a neck cream or moisturizer. Before sleeping in the night, remove the entire makeup from your body. Before sleeping also cleans your skin. Research has proved that in the night, your skin undergoes a procedure of removal and getting difficulty in breathing properly, if you don’t remove the makeup. You may also experience that sleeping with makeup will creates some spots on your skin. The Ayurveda contains all the solutions for your beauty as well as skin. Ayurvedic ubtans or scrubs nourishes your skin and assist it in better breathing. The good thing about it is that most of the ingredients are easily available in your kitchen. To make perfect beauty pack, you require Rose water, milk, one pinch of camphor, half teaspoon turmeric powder, sandalwood powder and Chickpea flour. Mix turmeric powder, camphor, sandalwood powder and besan (chickpea flour) in rosewater or milk to create a thick paste and apply it evenly on your face. Leave it for twenty minutes and then wash it with water. To create a more rejuvenating experience, you need to dip 2 swabs of cotton in cold rose water and put them on your eyes. Now listen to some good instrumental music, and after twenty minutes, you feel relaxed and have a glowing skin. During shaving some men have not a good experience. Because sometimes, they get rashes. According to views of some people, rashes will decrease their self- esteem. But this is not a big issue to consider. The best procedure to do shaving is that when you shave, the strokes of your razor must follow the hair growth direction. Many people do not take much care of their feet. They almost neglect their feet. If you don’t have enough time for the pedicure, then fill a basin or football with warm water and put some of your favorite oil into it. After that, soak your feet for sixteen minutes. Dry your feet and use a rough skin remover on them. After sometime, rinse that and properly dry your feet. To do pedicure, apply a body cream to your body for a quick and easy fix pedicure. One of the highly popular preventive measure, when it comes to the task of skin care is to protect your skin from too much exposure against sun. As we all knows that over exposure to sunlight is the reason of sunburn. Therefore, before stepping out, properly cover your body. Also, don’t forget to wear a hat. Apart from eating a healthy and balanced diet, regular exercise plays an important role in keeping your skin healthy. If you exercise properly and regularly, then your body remains fit and it will also enhance your skin glow also. There is no any need for you to go to gym six days in a week. Also, the stress of that type of impact will do much harm to your physique. Make a plan to perform exercise four days in a week for around forty-five minutes. Only select that exercise which you like the most such as running, yoga, swimming and walking etc. By selecting to exercise alternate days, it will provide enough oxygen to your skin. It nourishes as well as feed your skin. Doing workouts on alternate days, and offer a chance to your body for recovering is good. This will result into less stress and it also stops the build-up of toxic in the fat cells of your body. When the toxic is not build, then you can easily lose weight quickly. The main reason for people practicing the yoga is that there is attention on the breath as well as the body. You can easily remove toxins from your boy, when you exhale. The procedure of conscious breathing and the yoga will fasten the cleansing of your whole body and energized and refreshed your skin. It also offers a good glow to your face. Surya namaskar, jogging and running will improves the circulation of blood in your body. Sweating will be very good for your body. To clean your skin, wash your body with cold water. The right way of breathing will remove pimples and spots from your body. When our body is relaxed, then rashes and pimples will decrease. Sudarshan kriya technique of breathing releases and collect stress from your mind as well as the body. it relaxed our body, balance, harmony and restore our body. Stress is one of the major problem faced by the people. It is found that when someone is stressed; adrenal cortex do the conversion of adrenal androgens into hormone testosterone in female as well as male. This will result into hyper sebaceous glands. The double amount of testosterone is caused by release of adrenal androgens. The is also the main reason of your oily face and other parts of your body are dried because of dehydration. Take rest properly. The seven to eight hours of regular sleep is one of the best method for rejuvenating your skin. Take some time for relaxing, stop and breathing for a more peaceful complexion. Switch off your mind, radio, beeper, computer, TV and phone. Take some deep breaths and sit in a nice place for six minutes. Breath out and in via your mouth and nose. This will feed your skin, oxygenating your cells, and your entire body feels the flow of breathing. Windup with reading some inspirational quotes from a good book or make a cup of herbal tea for yourself.